La Casita Blanca - This is a superb1 bedroom house set in the beautiful valley of La Drova just north of the Costa Blanca. It consists of large lounge, bedroom, fitted kitchen and bathroom with walk-in shower. A ramp is also provided for easy access to the house. It has a swimming pool set in landscaped gardens and has secure parking. Local shops and services including 2 supermarkets, chemists, 3 butchers, 5 restaurants, doctors surgery, sports centre and church are only 5 minutes drive away. The house is set in the grounds of the owner's main property but is not in anyway overlooked. The pool is for the sole use of the guests. I am a retired computer specialist and worked for Digital Equipment Company in Reading Berks. I bought this property about 20 years ago as a holiday home but liked the area so much so have lived here for 15 years. 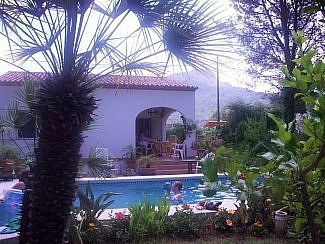 The area is very Spanish, our house and the Casita Blanca are built on 1800 mtr plot just outside the lovely village of Barx. What attracted us to the area was the natural beauty of the mountain scenery and walks for all levels if fitness. I had travelled many times throughout Spain and by chance stopped for coffee in Gandia on one particular holiday. I soon came to the conclusion that this was my sort of place. It has so much to offer for holiday makers and residents. It is still very Spanish and even though it is high in the mountains it is possible to be in the centre of Valencia within the hour.I had looked at other areas like Benidorm and Malaga but they were not really my sort of Spain. The Casita Blanca is a home from home place,we try to include everything a holidaymaker would require on a Spanish holiday. Only 14km to Gandia which is a a lively Spanish town with its own beach. pool and beach towels provided bathroom and kitchen towels changed twice i week. Large open-plan lounge/kitchen. TV High Fi. Selection of CDs and books. Fully fitted kitchen area with quality units having a breakfast bar, with gas hob, eye level electric oven, microwave. large garden area with tables and chairs,sun beds. Golf facilities with 30 minutes drive. a ramp to the villa. Notes on accommodation: A welcome pack is provided. Outside: There are 2 external patios. 1 of them is covered. The 2nd open patio is in the garden beside the swimming pool, which is provided for the sole use of guests. A ramp from the casita to the bbq swimming pool area is provided. Utility Room: Washing machine. Iron ironing board Cleaning / Towels / Linen / Maid service: Linen is provided and is changed twice a week. From the minute we arrived and were shown round the cottage and pool area, we new we had made a great choice. Everything you needed was provided including a lovely food starter pack. The morning after arrival Eddie gave us a local tour showing us where the shops and bars were plus a couple view points. In the cottage was a draw full of brochures of the local areas which Eddie would detail as and when required. The pool was an absolute Godsend as the temperature crept up to 40 with easy access steps with both full sun areas and full shade areas to cover every type of sun worshipper. Anything we needed was never to much trouble and if you wanted hiking or as we did do nothing it was a perfect spot. I would thoroughly recommend to any couple whether very active or just happy to relax with a book. We have just spent a wonderful three weeks at La Casita Blanca. This is top class holiday provision in a beautiful and peaceful environment. It more than fulfills its listing description being comprehensive in its provision, well-maintained and great attention to detain and customer needs. John and Eddie are excellent hosts leaving guests to enjoy their holiday but always available when needed to provide advice and information and indeed friendship. Having lived here for nearly thirty years Eddie and John have a wealth of information on where to go, how to get there, best places to eat etc. Just a great holiday location within easy reach of the coast with its many and varied beaches, local walks and a variety of interesting places to visit, and on those quiet days just relax on the garden patios by the pool. Our only problem was that time passed too quickly. We have no hesitation whatsoever in recommending this property to future guests. We will look forward to your next visit to La Drova. We have just returned from another perfect week at this property.The pool is fantastic for either cooling off or putting in a few lengths. John and Eddie are the perfect hosts,helpful when necessary loads of useful information but also very relaxed and let you get on with your holiday your way. Everything is nearby from the local village shops to supermarkets and of course the superb beaches a short drive.Thelocation though is so peaceful with superb views of the mountains. All in all a great get away. Trevor and Clare stayed in la casita Blanca many times before and we are pleased that once again they have enjoyed their holiday,it is always nice to welcome back repeat clients. As usual they departed leaving the chalet in an immaculate condition,very much appreciated by us and hope to welcome them back in the further. We spent a thoroughly enjoyable week in La Drova. Having arrived without the aid of a car, we were content to spend our time swimming in the pool and relaxing in the beautiful garden, reading, gazing up at the wonderful scenery and getting a tan! A daily stroll into Barx for supplies or the odd meal was very pleasant and we also ventured further into the hills - great views but probably less taxing in cooler whether! The casita itself was very well equipped and spotlessly clean. DVDs, books and board games meant that the evenings were just as relaxing as the days. Highly recommendable. clean for the next guests it was much appreciated. Do keep in touch as we are sure we become firm friends in the future. Kind regards, John and Eddie. The beaches are about 20km drive. Valencia airport, with scheduled direct flights from Heathrow and Gatwick, economy airlines, ie Ryanair and Easy Jet are available from Stansted to Valencia, approx one hour away. Alicante airport has excellent flight connections to most parts of the UK and is about 1.5 hours away. ryanair also fly from Dublin to Valencia and Alicante during summer. The village of Barx is 5 minutes drive, or 20 minutes walk. About 1.5 km. If it's just beaches, boozing and bopping you are after you'll probably prefer Benidorm. We offer tranquility and comfort with a touch of class in the tiny village of La Drova hidden in the mountains, but less than an hour's drive from Valencia airport. Our spacious cottage is designed to accommodate just 2 people, has every convenience of home and is set in extensive walled gardens overlooked by mountains and woods. The swimming pool and surrounding facilities are for your sole use. The friendly local village has neighbourhood shops, bars and restaurants plus 2 supermarkets. Those with a thirst for histoy may visit nearby Gandia or Xativa with their ancient links to the powerful Borgia family with its Renaissance saints and sinners. For history, art and cutting edge modern architecture, a day trip to Valencia is a must. Visit Calatrava's stunning City of Arts and Sciences, the bustling Art Nouveau Market, the largest and most diverse in Europe,the Gothic cathedral containing the Holy Grail, Bull Ring, and throw in some retail therapy in the prestigious shopping quarter. Nature lovers will revel in the vast wetlands of nearby Albufera, a bird lovers paradise set among rice paddy fields and waterside restaurants serving authentic paella in the location where it was invented. For a day away from mountain hiking why not drive 20 mins to the uncrowded sunny beaches of Gandia Playa, not yet discovered by the great British public. Fancy a game of golf? Oliva's fine golf courses are nearby. Depending on the calendar you may catch one of the many local fiestas, celebrations filled with colour, music, fireworks and spectacle. Yachtsmen in the nearby marinas are already preparing for the forthcoming Americas Cup in Valencia. If it's activity and relaxation that you are after, but with that special difference and discernment,away from the Costas and surrounded by peace and the beauties of nature,why not contact us. Booking Notes: A 25% deposit is required on booking with the balance paid within 6 weeks of the arrival date. For late bookings the total amount must be paid in full on booking. Guests are strongly advised to take out a holiday insurance at the time of booking, as these charges are non-returnable. A £100 security/breakage deposit is also payable. Changeover Day: Saturdays but can be flexible. Mid morning departure and arrival mid afternoon. Notes on prices: Prices are for the property per week in UK pounds or euro equivalent. Short breaks min 2 nights off peak. For long winter letting period the prices are negotiable. The villa is an ideal location for people wishing to look for property in the area.